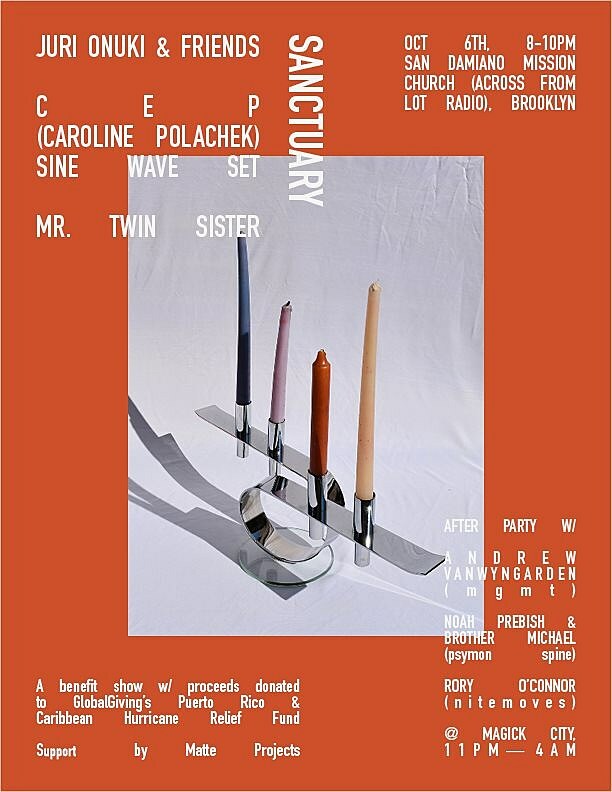 Mr Twin Sister and former Chairlift singer Caroline Polachek, will play benefit for Puerto Rico and Caribbean hurricane relief in Brooklyn on October 6 at San Damiano Misson Church (across the street from The Lot Radio in Williamsburg). Mr Twin Sister will perform a full-band live set while Polachek will do a sine-wave set as CEP, and there will also be a performance by choreographer Juri Onuki & Friends. Tickets are on sale now and proceeds benefit GlobalGiving’s Puerto Rico & Caribbean Hurricane Relief Fund. Your ticket to the benefit also gets you into the afterparty at Magick City (37 Box Street) featuring DJ sets from Andrew VanWyngarden (MGMT), Noah Prebish & Brother Michael (Psymon Spine), and Rory O’Connor (Nitemoves). This also serves as a warm-up show for Mr. Twin Sister’s appearance at Miami’s III Points festival a week later.